We have a small wardrobe of costumes and our performers will always come suitably attired for the story. We don't insist that guests come in fancy dress for our murder mysteries, but, particularly when playing suspects, guests are welcome to dress to suit the character or period. Many of our scenarios are produced so that you can source suitable costumes from you own wardrobe or charity shops, but if you want something more unusual, we can help. 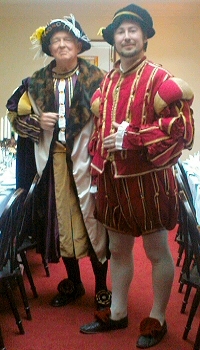 In many cases we can source outfits from local dramatic societies if we have measurements for your guests. These would typically cost around £15 per costume. In some cases, such as pre-Victorian scenarios or military uniforms, it may me necessary to hire from a specialist costumier, and we usually use Bath Theatrical Costume Hire in Frome, Somerset. Costumes will cost from around £30 per head and we will make a small collection charge to cover transport costs. If you don't want to wear fancy dress, we can usually supply a few hand props etc. to suggest character for no additional charge. If you wish to purchase or hire larger items, please see our murder mystery props page for details.